A peasant had three sons, and he sent the eldest to guard the vineyard. During the night, a frog came up to him and asked for a piece of the cake he was eating. Angrily, the young man threw a stone at the frog and in the morning the vineyard was ruined. The same thing happened to the second son the next night. The following night, the youngest son offered to watch the vineyard. The family thought very little of him, and he always sat in the cinders, so he was called Cinder Jack. But they allowed him to try. When the frog approached, he shared his cake. In return, the frog gave him three rods of copper, silver, and gold; and told him that three horses of the same material would come to destroy the vineyard unless he used the rods. Cinder Jack was able to subdue the horses, and the vineyard flourished; but he did not tell his family the secret of his success. One day, the king erected a high pole and hung a golden rosemary on the top, promising his daughter to whoever could reach it in one jump on horseback. All the knights of the realm tried, but failed. Then, a knight in copper mail, on a copper horse, came and took the rosemary, and disappeared. When Cinder Jack's brothers returned home, they told him all about the mysterious knight. Their brother claimed he had seen the whole thing from the top of the hoarding, so his brothers had it pulled down, so he wouldn't be able to see anything else. The next week an even higher pole was put up with a golden apple at the top, and the same promise. 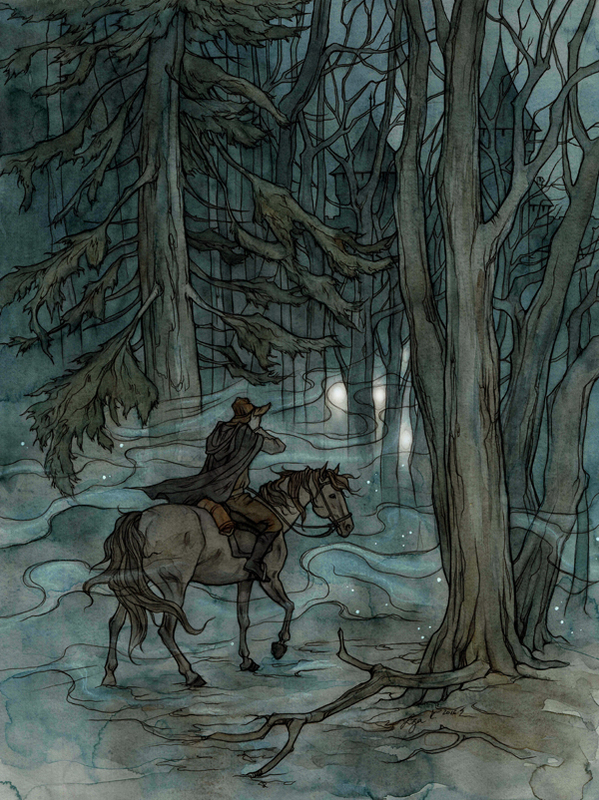 This time a silver knight on a silver horse took it and disappeared. When Cinder Jack told his brothers he witnessed the whole thing from the pigstye, they had it destroyed. The following week, a gold and silk kerchief was placed on yet a higher pole, and a gold knight took it and disappeared. Cinder Jack claimed to have seen it from the top of the house, so his brothers had the roof taken off. The king invited the mystery knight to come forward with the rosemary, apple, and kerchief. The people were astonished to see that it was Cinder Jack, and he was good hearted enough to rebuild his brothers' house and give them gifts. "Cinder Jack is reigning still, and is respected and honored by all his subjects!" 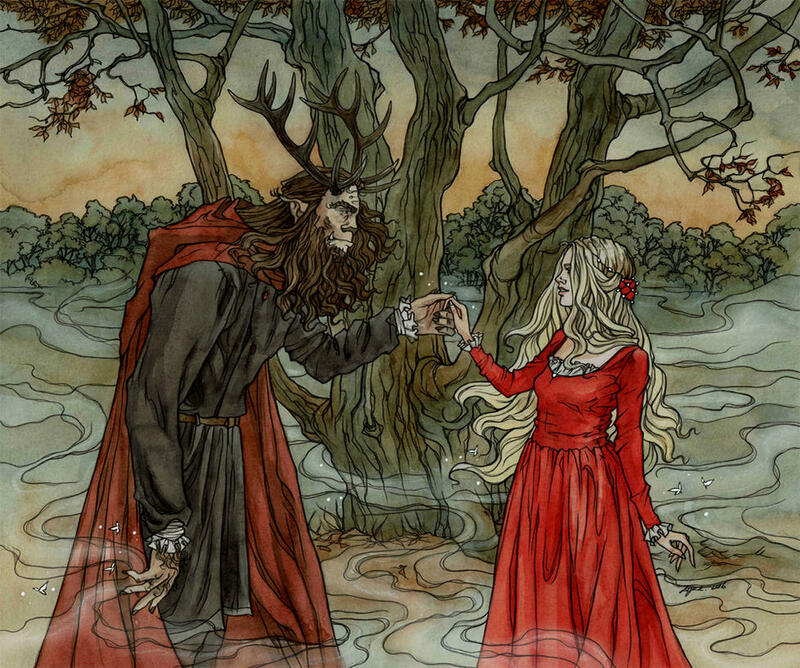 I find gender bent fairy tales to be fascinating-in some ways they might seem to confirm gender bias but the mere fact that they exist proves that gender roles in folklore may be more flexible than we often assume. For example, I like the fact that Jack forgives his brothers. Although Cinderella gets criticized for forgiving her sisters in some versions, and it can be troubling and seem naive, when a man forgives and even goes beyond that to restore their house and give them gifts, it comes across less as weakness and more as him being the better man taking the high road, at least to me--(which makes me wonder how much of my/culture's interpretations themselves are biased and not the character's actions themselves?). Then again, it depends on each story; in this tale, Cinder Jack was clearly manipulating his brothers and Cinderellas don't tend to do that. Then there's the matter of how Jack wins the bride-rather than simply appearing beautiful as Cinderella does, he performs feats of strength, which on the surface seems unfair and to reveal unbalanced gender expectations. And yet...is jumping really high on a horse that much more impressive than Cinderella's feats of dexterity, sorting grains, etc.? Especially when considering the fact that neither of them are actually performing their impossible tasks on their own merits, but using aid of magical helpers they befriended because they were kind? What do you think of Cinder Jack? This is the first book I owned in the Surlalune series! 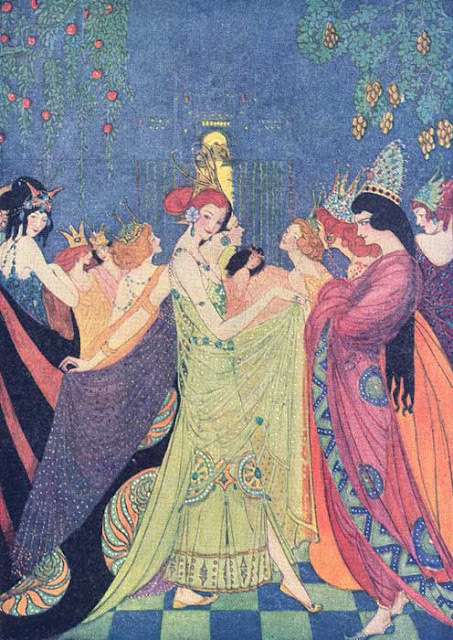 My favorite fairy tale other than Beauty and the Beast is the Twelve Dancing Princesses, and it's incredibly hard to find anything written about it, so being able to delve into multiple variants--most of which were completely unfamiliar to me--was like discovering hidden treasure! One of the things which always fascinated/mystified me about this tale was the nature of the underground kingdom the Princesses travelled to each night-why did it need to be destroyed? Was it evil in any way other than being an inconvenience due to the rate at which the Princesses went through dancing shoes? The Grimm version provides no explanation. Fortunately the variants from around the world did provide some insight. In many versions of this tale, the underground kingdom is more specifically defined as hell, or a land of giants, trolls, etc. In Afanasyev's tale from Russia, the Princesses went to the home of the Accursed Tsar. Some versions explain the nature of the Princess' curse. In Romania, "these Princesses were fore-doomed, and they couldn't marry until someone was found who would guess their doom and make one of them love him. The doom that weighed upond them was a passion for dancing. 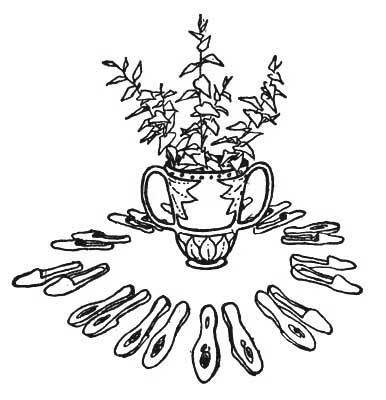 They were mad on dancing, and so every night they wore out a new pair of white silk slippers each. 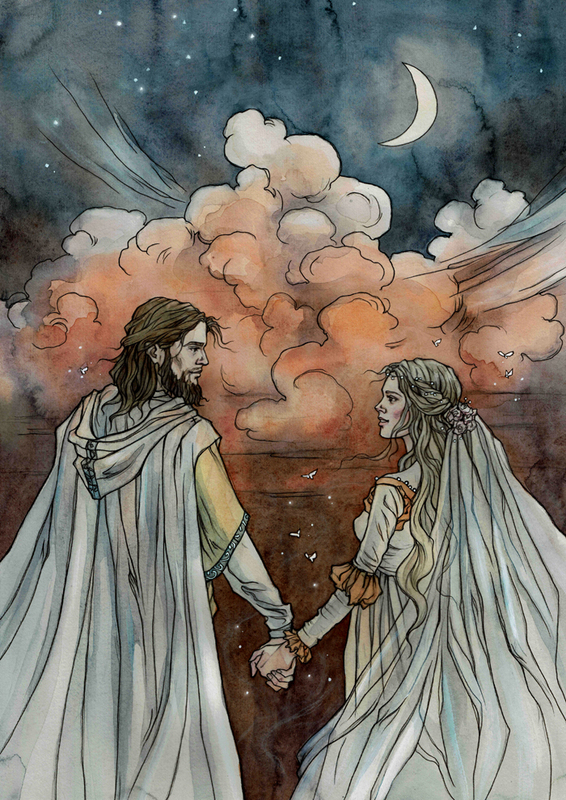 "...later it is implied that another side effect of the curse was that they had icy hearts and were incapable of love, and that the music in the castle was enchanted such that any listener was forced to dance, whether willing or not. A German tale (not the Grimms') describes the spell: the princesses had been dancing for five years. If they had danced one more year, they (the Enchanted Princes, I assume) would have been saved. The other alternative was for the princesses' heads to be cut off, as they were, for denying everything. The exact words say the elder sisters had "allowed" their heads to be cut off, so I guess they sacrificially saved the princes from enchantment? Yet they are still punished and the daughter who confesses rewarded. In Hungary, the girls travel by broom to hell, where they dance on a floor full of razors-which explains why these three daughters destroy three hundred pairs of shoes. The girls in this story are rewarded according to their willingness to go-the older two had a lover and a son in hell and were killed, but the youngest was pure because she had no one there. Another very similar tale is found in the Czech Republic. Yet another Hungarian story describes sisters which spend the night dancing with fairy youths, who are killed (except the youngest) for witchcraft. For more on the nature of the Underground Kingdom in variants of Twelve Dancing Princesses, there's also a Part II including more tales from around the world! I got a new book for Christmas! 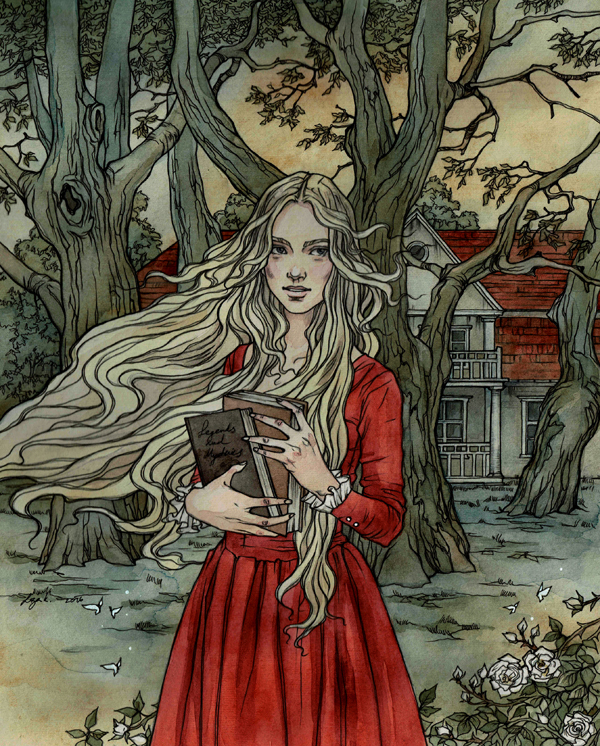 Disability, Deformity, and Disease in the Grimm's Fairy Tales by Ann Schmiesing. I had heard about it on Surlalune and the topic is one of special interest to me-although I'm mostly a stay at home mom now, I also teach a couple music classes to adults with intellectual disabilities. And I'm now amazed I've never realized how common a topic disability is in fairy tales before! I've only read the introduction so far but I'm really excited to read more. As Schmiesing points out, there are very few studies done on the topic of disability in fairy tales, despite how often it occurs (think the birds pecking out the stepsisters' eyes in Cinderella, or thumbling tales, or many other examples the book will explore). In fact, disability usually functions in one of two basic ways: it sets a protagonist apart and gives them an extra challenge to overcome (such as thumblings) or is indicative of a villain, either by nature or given as a punishment. In fact, some form of disability is often the impetus of the story itself. David T. Mitchell suggests that the purpose of stories is to explain that which has "stepped out of line", and that understanding differences in people are one of the things that "propel the act of storytelling into existence." Thinking of disability in broader terms, it's not surprising that it appears so often in the Grimms' collection. Wilhelm suffered from poor health, and his first son grew very ill and died in infancy. Because of poorer living conditions, illness and other disabling conditions were far more common during the Grimms' lifetimes, when the average life expectancy was only about 35. Of course, the stories often treat disabilities in ways that aren't exactly politically correct today. 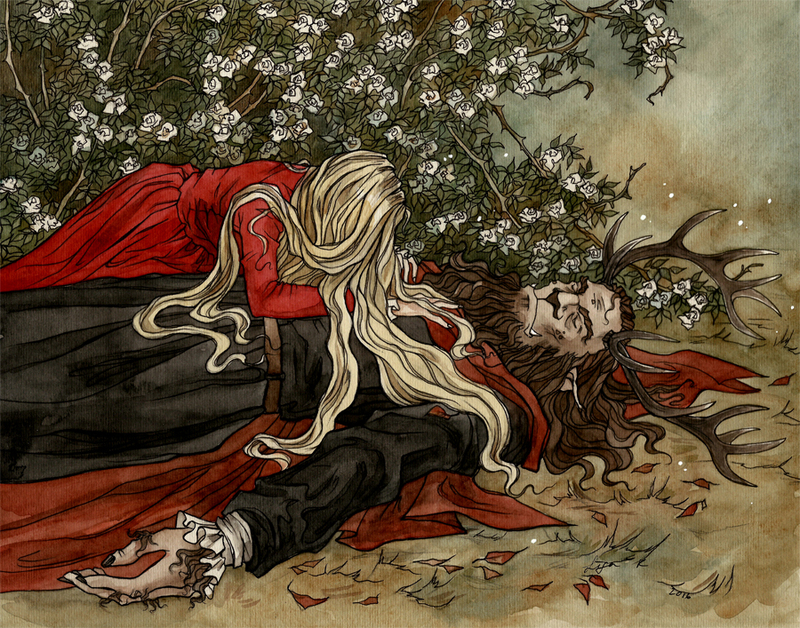 Most people are aware of some of the issues in fairy tales when it comes to gender studies, but not as many people are aware of issues when it comes to people with disabilities in literature. 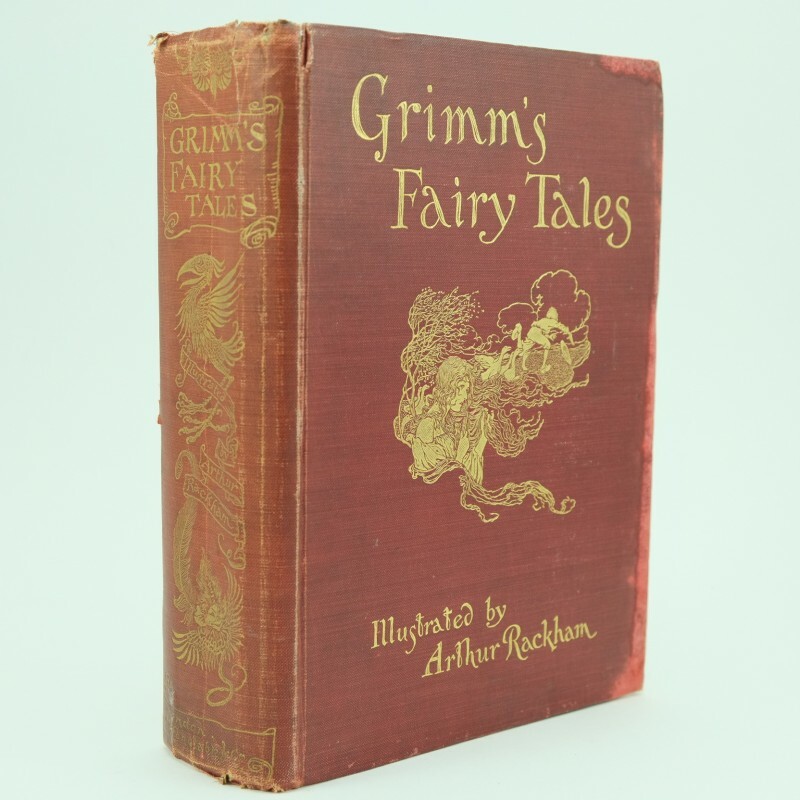 The Grimms were a product of their time, as were their storytelling sources. When folklore scholars have attempted to tackle these issues they often lack sensitivity and awareness, but many disability scholars may not have a proper grasp of fairy tale studies (Schmiesing cites one article that mistakenly assumed that the Grimms were not two collectors and editors, but one author, "B. Grimm"!!! I'm extremely intrigued as to where that "B" came from...) Interestingly, as Wilhelm edited the stories over the course of the editions, he tended to (probably unintentionally) enhance or add portrayals of disability. 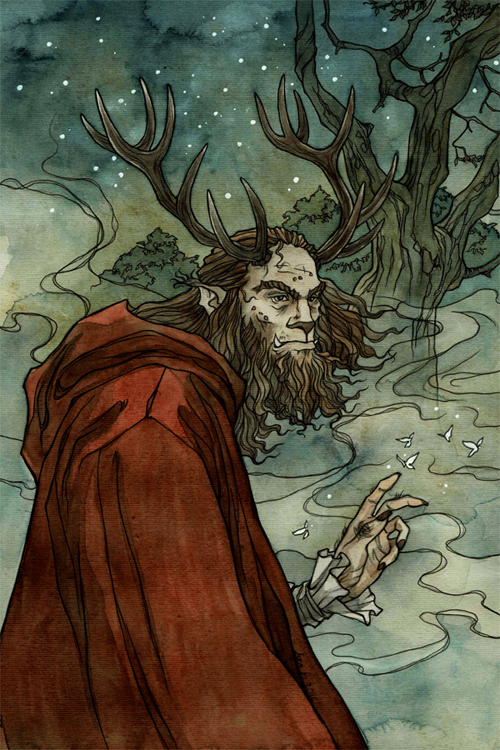 Other authors, in Schmiesing's opinion have taken disability in folklore a little too literally, attempting to give various characters a specific diagnosis. This is often just speculation which ultimately misses the point of how the disability functions. Yet others don't take it literally enough-treating the disability as only a metaphor representing something else and ignoring crucial parts of the story. 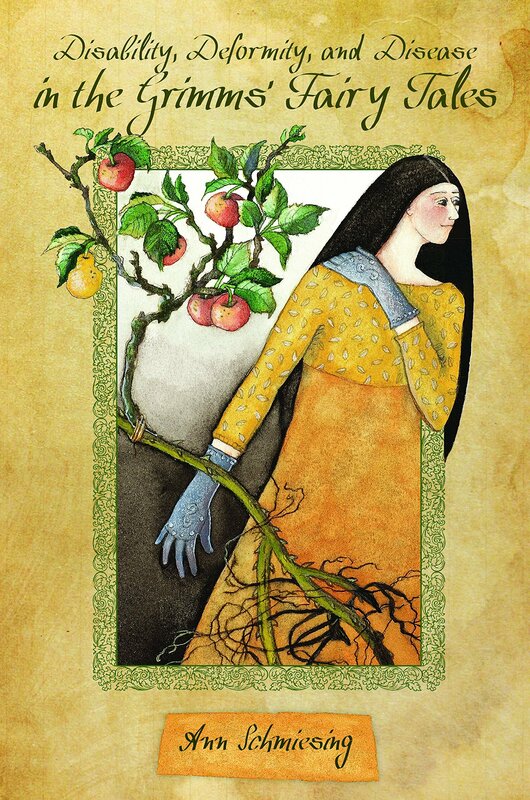 Fairy tales are certainly a challenging genre to study because of their nature, taking place in "a world in which metaphors take on literal meaning.," as she quotes from Maria Tatar. But from everything I've read so far, I think Schmiesing will strike that much needed middle ground, as someone who is aware of both disability and folklore study. Can't wait to read more! I had another Christmas post planned for last week, but then...Baby decided he had other plans (that involved refusing to nap for a while). But I did want to share this fascinating article from npr (which I found via this post by Maria Tatar, which includes other links to interesting and related articles). Researchers studied how easy it was to get children to believe in a fantastical creature, a made up "Candy Witch" who would swap candy for toys at Halloween. It certainly applies to children who believe in Santa Claus, a topic that has been more pertinent as Tony and I wonder how we'll navigate the issue when our son gets older, as well as fairy tales in general and how they are perceived. In their experiment, they found that children were more likely to believe in the Candy Witch if they had evidence to prove it (such as overhearing their parents making a call to the Candy Witch and finding some candy swapped for toys). Also, younger children (around 3 or 4) were no more likely than slightly older children (up to 7) to believe-evidence was more important than age, until around 8, when belief in fantastical creatures significantly decreases. But not every child believed, even those told about the Candy Witch by their teachers and parents. So not every child will just accept everything told them, even young ones, or from trusted sources. Children observe and weigh evidence as they conclude what is or isn't real. Personally I think that Christmas movies, which usually tend to be all about how Santa Claus is real and portray believers as "good" and skeptics as villains, are a pretty significant influence as well. Parents, how do you handle Santa Claus in your house? World Weaver Press has a new Christmas collection this year! 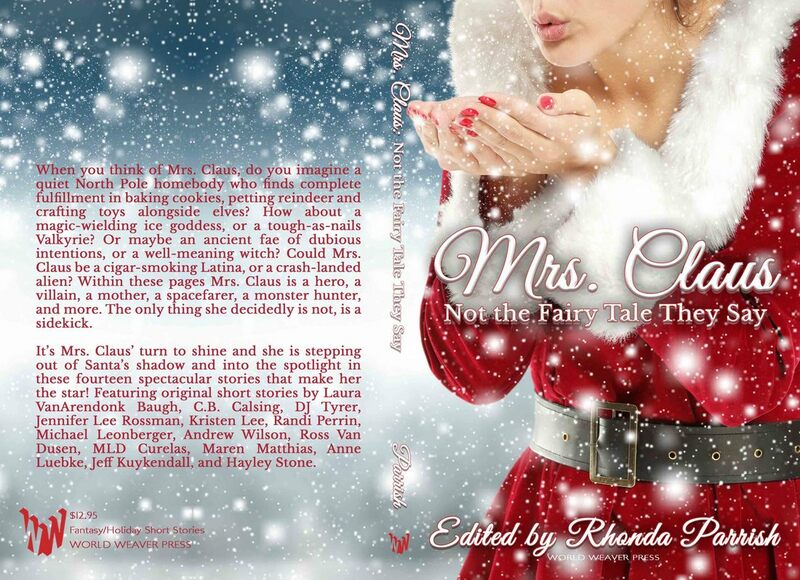 Mrs. Claus: Not the Fairy Tale They Say, as the title suggests, features Mrs. Claus in several different reimaginings. I knew I wouldn't have time to read it this year (I'm still working on my Krampus stories!) but it may be of interest to you readers. I'm fascinated with the evolution of the Santa myth, and it's interesting that St. Nicholas managed to gain himself a wife as he became the family friendly figure he is today. 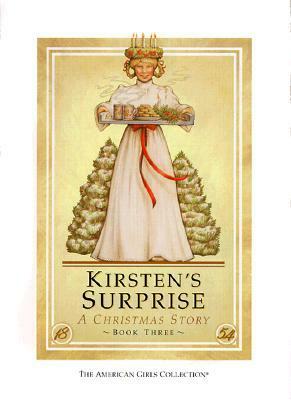 I've read a bit on the history of Christmas traditions and Santa Claus, but Mrs. Claus doesn't feature much in those books and now I'm even more curious about her history. 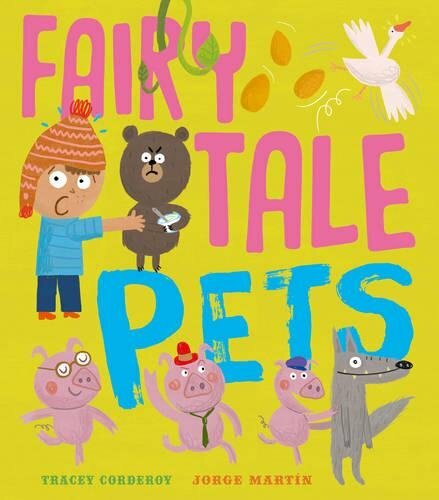 If you're Christmas shopping for children this season, one of the Parents Magazine's top 10 Children's Books of 2017 was Fairy Tale Pets by Tracey Corderoy and Jorge Martin. Looks pretty cute! Bob has decided to be a pet-sitter. He just can't wait for all the cute hamsters and bunnies to arrive! But when Goldilocks asks him to look after her grumpy baby bear, the fairy tale chaos begins... Spot your favourite characters misbehaving in an all-star cast as the golden goose, three billy goats gruff and - yikes! - a troll arrive at Bob's door. Whatever will he do? 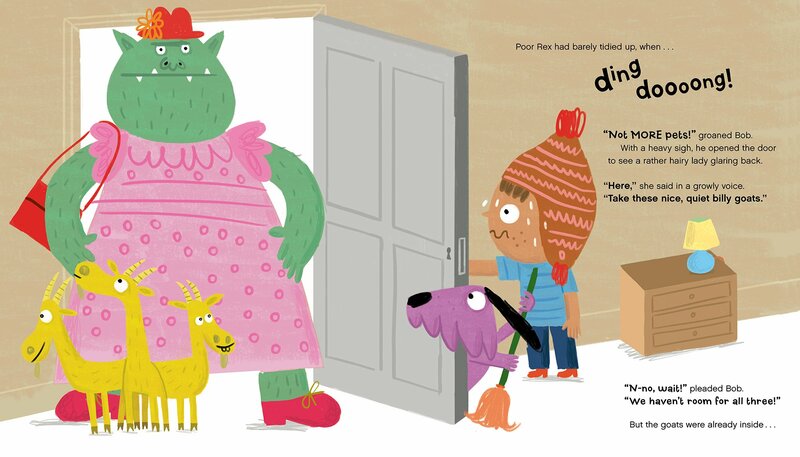 A hilarious new picture book from award-winning author Tracey Corderoy (Squish Squash Squeeze!, Now!, Why?, More!) and talent illustrator Jorge Martin. Perfect for anyone who has ever wondered what fairy tale pets get up to in their spare time! 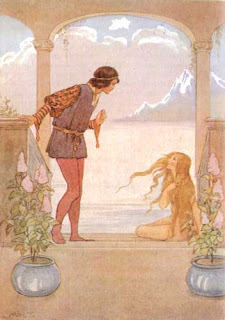 Fairy tales are often accused of portraying negative female stereotypes, encouraging young girls to become passive and silent and obedient to men. In one sense this is true-when men such as the brothers Grimm collected fairy tales, they tended not to include stories which existed in folklore that featured strong, clever female heroines, and instead gravitated (however consciously) towards stories with active males and passive females. Not only that, but as Marina Warner cites from Ruth Bottigheimer's analysis of speech patterns in the Grimms, as the Grimms published their later editions, the female heroines used less and less words and the female villains spoke more. Thus girls tend to subconsciously receive the message that to be good and desirable like the female heroines in the stories, they must be quiet. There are two famous examples of females who aren't simply reserved, but are completely unable to speak--Hans Christian Andersen's Little Mermaid, and the sister from "The Wild Swans" and its variants. 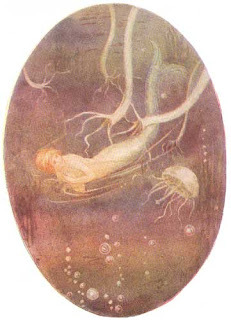 The Little Mermaid stands in direct contrast to the sea maidens of antiquity, the sirens. 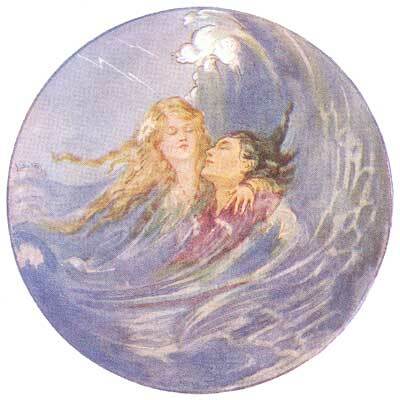 Sirens used their voices, beautiful and alluring, to draw men to them and cause their death. Their voices are therefore powerful, and evil. The Little Mermaid gives up her voice willingly for the chance to win the love of a prince and her immortal soul. Now the desire is hers, but it is she who is forsaken. The Disney version makes Ariel, in Warner's words, "a fairytale heroine of our time." She knows what she wants (another word count fun fact-the word "want" is spoken by Ariel more than any other verb) and will go through anything to get it, but this time hers is a happy ending. 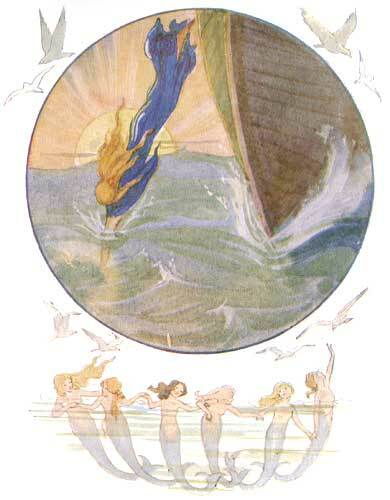 But in this version, according to Warner, "female eloquence, the siren's song, is not presented as fatal any longer, unless it rises in the wrong place and is aimed at the wrong target." The female voice is now powerful like the siren's, but not inherently evil. 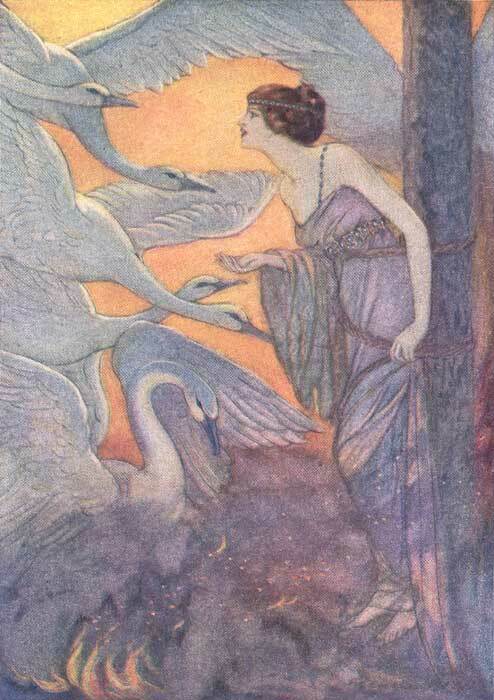 The sister in the Wild Swans is silent by choice (in a way)--if she speaks one word before the shirts of nettles are made and placed on her enchanted brothers, they will stay swans forever. In one sense, this can be seen as yet another example of encouraging women to be quiet and submissive, but although she is rewarded for enduring, the silence is clearly meant as a hardship--the happy ending includes a return of her voice. 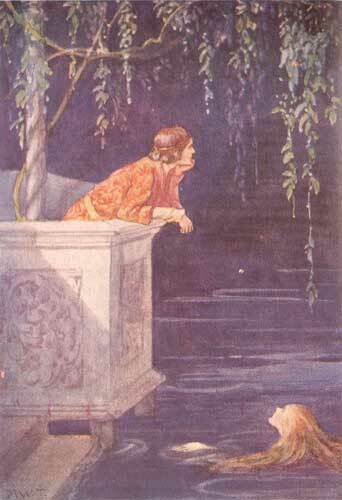 Other tales have forms of silenced heroines as well, such as the heroine from Goose Girl, who gave her word (under pressure) not to tell the truth of her situation to a living being--but she is able to find a clever way for her to reveal the truth anyway. It's possible that, as women throughout the centuries were frustrated at their own lack of voice within the community and family, they told stories such as "Wild Swans" to express their own frustration. Yet there is also something to be admired in the self control and determination of the heroines. This is Warner's personal memories of reading the Wild Swans, one of her favorite childhood stories: "it still seemed to me to tell a story of female heroism, generosity, staunchness; I had no brothers, but I fantasized, at night, as I waited to go to sleep, that I had, perhaps even as many tall and handsome youths as the girl in the story, and that I would do something magnificent for them that would make them realize I was one of them, as it were, their equal in courage and determination and grace". The actions of the sister are indeed impressive-there are different forms of heroism, not all that are as easy to recognize. Fortunately, we are not as constrained by the severe gender expectations of the Victorian times, but that doesn't mean these stories or even these particular versions have to be thrown out and completely replaced with new "girl power" tales. There are times when we all feel silenced-we don't feel like our opinions are being taken seriously at work, we feel overlooked in a certain relationship, etc.--and even today people of many races, faiths, and sexual orientation are still being denied basic rights. It can be encouraging to read stories that give us hope that there will come a time when we will be able to speak again and the truth will be revealed. I'm no sushi expert by any means, but Tony and I do enjoy it every once in a while for a special dinner. 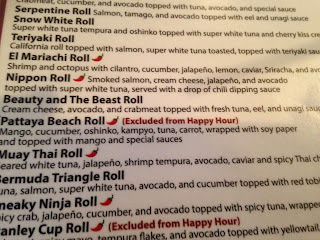 We were out for a date and I was thrilled to discover something I had never seen before: a Beauty and the Beast roll! Of course I had to get it. 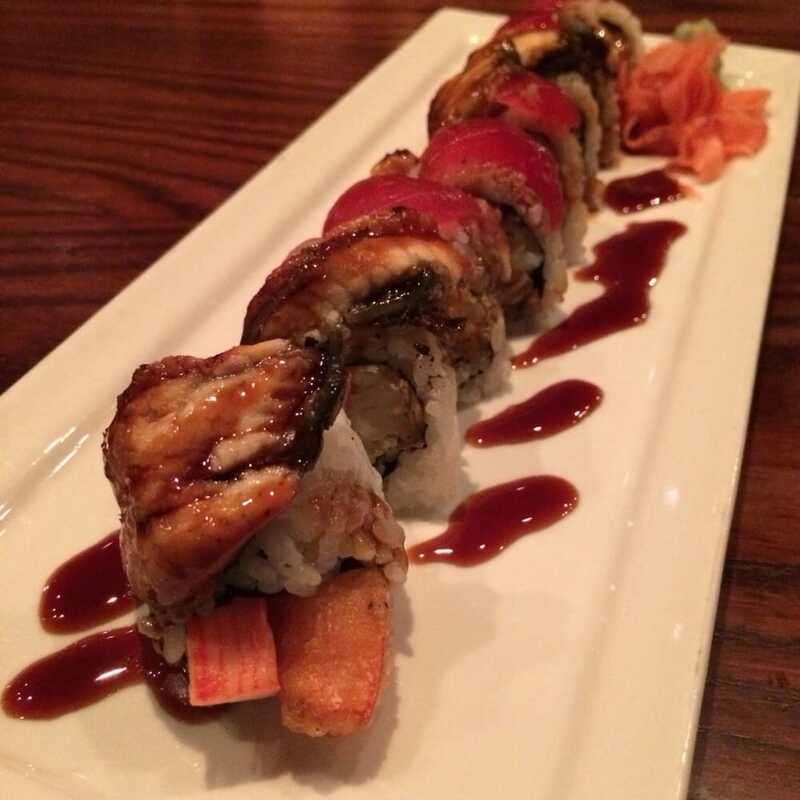 Most sushi menus will feature a Snow White roll, with snow crab and white tuna, also on the menu above. I liked that this restaurant also topped it with "cherry kiss cream" which I don't think is usually part of the description. 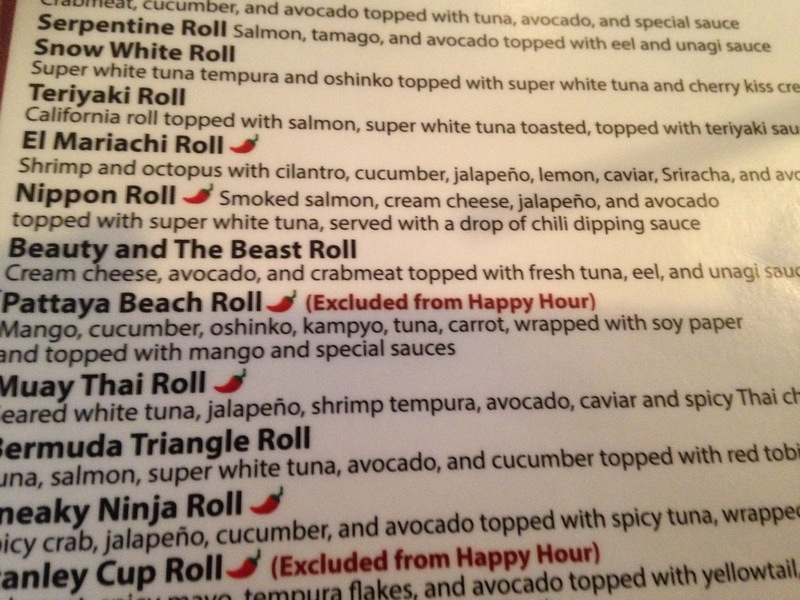 I thought that the BATB roll would be only a local specialty but it turns out there's a somewhat standard recipe for it-this picture is from a restaurant in Orlando. I did find one restaurant, Thelonious Monkfish, that has a specialty fairy tale sushi roll section. It's fun, and although mostly random, you can see some connections between the tale and the ingredients. The menu even includes little descriptions/snippets of the tales too. Fairy tale menu below. Has anyone else come across any fairy tale rolls? 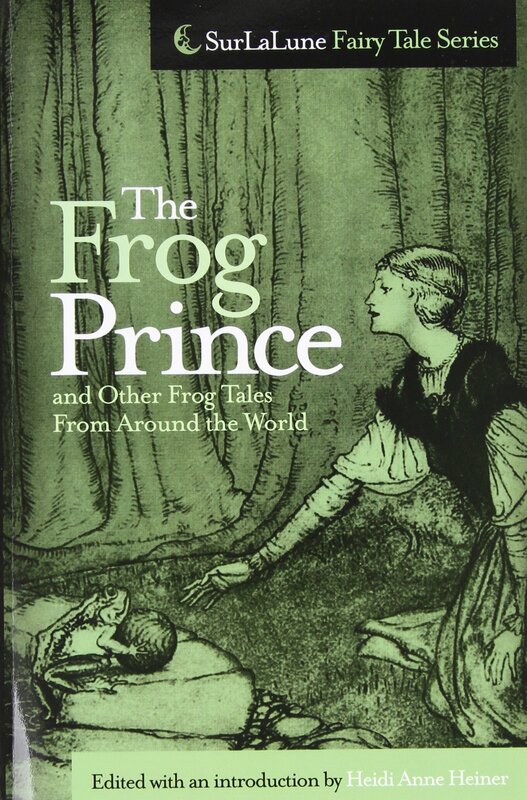 In one version, the princess flings the frog against a stone wall; in another, her kiss precipitates its transmogrification into prince; but what to do if your prince is actually a frog and not the other way around? The interior:salmon, mango + tempura crunch; the exterior:layered with avocado + crowned with spicy snow crab + tobiko salad. Three times, he spun straw into gold, then awaited his prize. Under a coverlet of dark branches, round a smoky fire he danced a jig. “Today I brew, tomorrow I bake; then the Prince child I will take; for no one knows my little game: that Rumpelstiltskin is my name!”Inside: wok-roasted balsamic-glazed shiitake,yellowtail, asparagus tempura + green apple. Outside: fresh tuna, drizzled with wasabi mayo; topped with spring onion confetti; crowned with crispy yu mein noodles.